Come home to where the deer, the elk, and the buffalo (close by) roam. 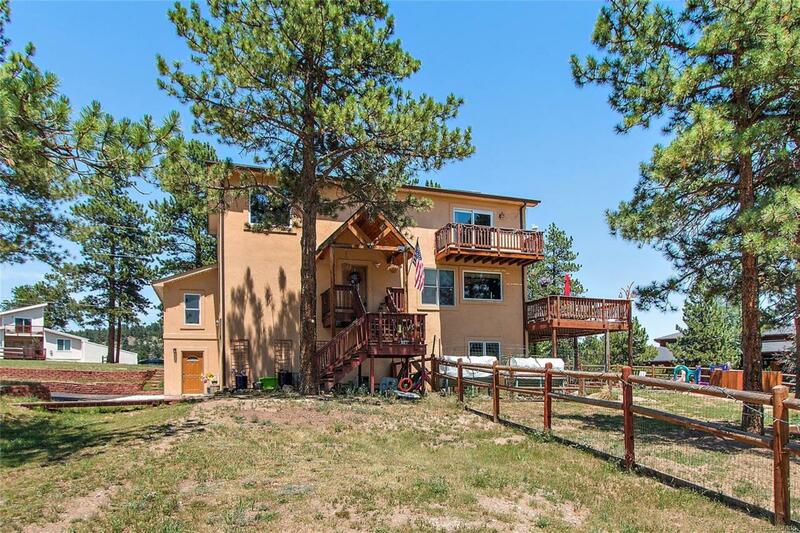 This beautiful mountain contemporary home, situated on 2 acres of professionally mitigated land (the owner is the fire mitigation specialist with Evergreen Fire & Rescue) has much to offer. The addition added in 2014 is a grea gathering space for family & friends. Or, gather around the granite bar top in the kitchen a cook dreams of; with a double convetion oven, plus a stove/range/over, along with plenty of counterspace. There is plenty of entertainment space, both inside and outside on the large deck area with great views. Wondering where to put your outdoor "toys"? No problem with the attached 3 car oversized garage, 12' x 12' storage shed and RV pad. You don't have to venture far to find something to do outside. The HOA includes access to a 22 acre recreation area, including tenni courts, beach volleyball, basketball courts, a pond stocked with fish, and much more. Come claim this home as yours.